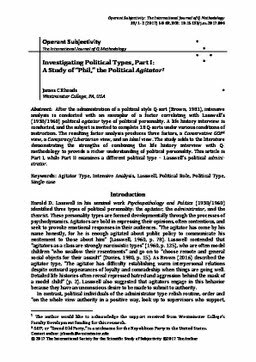 After the administration of a political style Q-sort (Brown, 1981), intensive analysis is conducted with an exemplar of a factor correlating with Lasswell’s (1930/1960) political agitator type of political personality. A life history interview is conducted, and the subject is invited to complete 18 Q-sorts under various conditions of instruction. The resulting factor analysis produces three factors, a Conservative GOP2 view, a Conspiracy/Libertarian view, and an Ideal view. The study adds to the literature demonstrating the strengths of combining the life history interview with Q- methodology to provide a richer understanding of political personality. This article is Part I, while Part II examines a different political type – Lasswell’s political administrator.